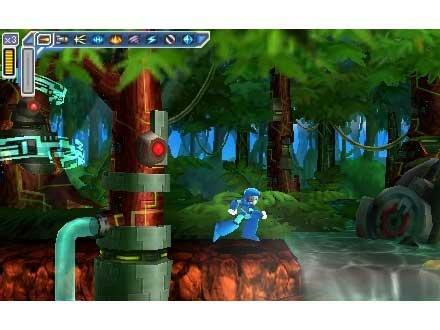 Megaman X remade for the PSP. 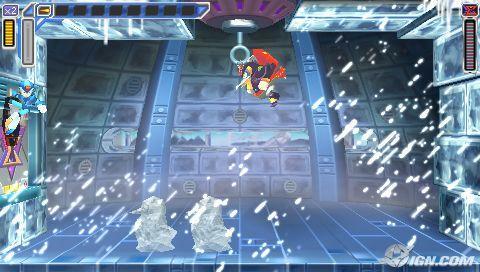 Mega Man X Maverick Hunter is a modern PSP makeover of Mega Man X for the SNES. Fans of the series may want to check it out for the different feel and take on a classic; strangers to the series will enjoy an extremely solid 2D platformer, based on one of the classic games of yore. In order to quell a Maverick Reploid uprising, X, a B-Class Hunter, must take up arms against his former commander, Sigma. Like every Mega Man game, you blast your way through 8 levels before beginning your assault in the final stages of the main antagonist's fortress. Gameplay is quite simple, as it should be; you shoot, jump, and once you have the proper upgrade, dash your way through levels in order to reach the boss at the end of a level. Once you defeat a boss, you absorb his power and can then use a variation of his weapon as your own. Each boss is weak against another boss' weapon, so the order in which you complete the stages can make the going a lot easier. 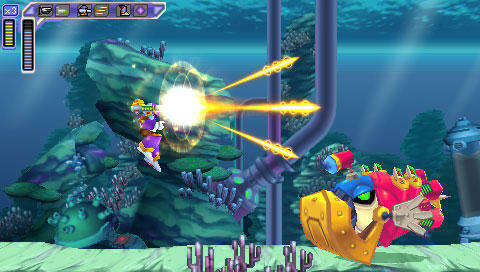 The levels are quite faithful to the original, though they do throw in some surprises. X's powerups are scattered in different places than in the SNES version, but this only serves to add some freshness to the game. I also noticed a lot of collision detection with objects that didn't have any in the SNES version. No biggie, but it did force me to change my approach in some levels. The game is a bit short, but not unexpected, since the original was a short game as well. To be fair though, there aren't many 30+ hour Mega Man games on the market, let alone 8+ hour ones. I had a bit of an issue with the fact that the widescreen format leads you into some blind jumps here and there, but those instances were few and far between. However, they did not occur often enough to ruin the overall experience of the game. After all, Mega Man games always found a way to pose a challenge to gamers, even if some of those challenges felt cheap at times. Nonetheless, the controls in the game are stellar; if you misstep, or jump into a bottomless pit, it's your own fault, not bad controls. Unlike the original Mega Man series, X games try to throw in a bit of narrative into the mix. 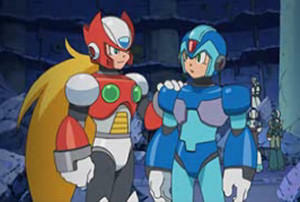 Mega Man X Maverick Hunter takes it a step further and adds a lot more dialogue between X and the main characters in the game. This helps to create some interplay between central figures in the game. It may not be a huge deal to those that enjoy the simple blast-fest that is Mega Man, but I thought it was a cool story feature to add into the mix. Once you complete the game, you unlock a short anime film that shows the events leading up to the game's scenario. This is another cool add-on for diehards of the X series. Another unlockable, once the game is finished, is the ability to play as Vile, who is positioned as X's main rival in Maverick Hunter. This definitely gives a different take to Mega Man X, since Vile plays very differently from X. His journey is also punctuated with some story aspects, which fills in some information gaps nicely. It's also some motivation to replay the game, as well as the addition of a hard mode for the professional Mega Man X player. The main thing veterans of Mega Man X will notice is the graphical makeover of Maverick Hunter over its SNES progenitor. The graphics are rendered in 3-D, which makes for some nice eye candy. Everything is redone from an aesthetic point of view, and nothing looks bad. Even the smallest foe's details are quite impressive. Visually speaking, this game can do no wrong for a portable platformer, except the aforementioned blind jumps due to the widescreen format. The sounds in the game are, for the most part, excellent. Like the graphics, the background music in each level has been redone, and each song sounds awesome. Mega Man games have always treated gamers to some decent tunes, even in the 8-bit days, and Maverick Hunter definitely delivers here. There is no annoying, repetitious music in the game. Every track has the proper Mega Man feel. My only real gripe with the sound is that the sound effects were changed. The X-buster doesn't have the familiar pew-pew-pew it once did. Neither does the X-buster's charge, especially on the third level of charging. These aren't major issues, but for some reason, it really bugged me that dashing, shooting, colliding with enemies, and jumping didn't elicit the same sound effects that I expected to hear. Again, this isn't major, but it would have been nice to hear those familiar sounds. Voice acting could definitely have been a bit better too. Zero's death speech is the standout of horrible acting. In the end, if you're looking for a solid platformer that provides a decent challenge, this game is for you. Don't expect a marathon gaming session though; it's a fairly short romp after all. But, Mega Man games have a certain charm that, once you're hooked, can make them as replayable as a game with multiple endings. This is definitely a game worth trading for, or bought on the cheap, if possible.